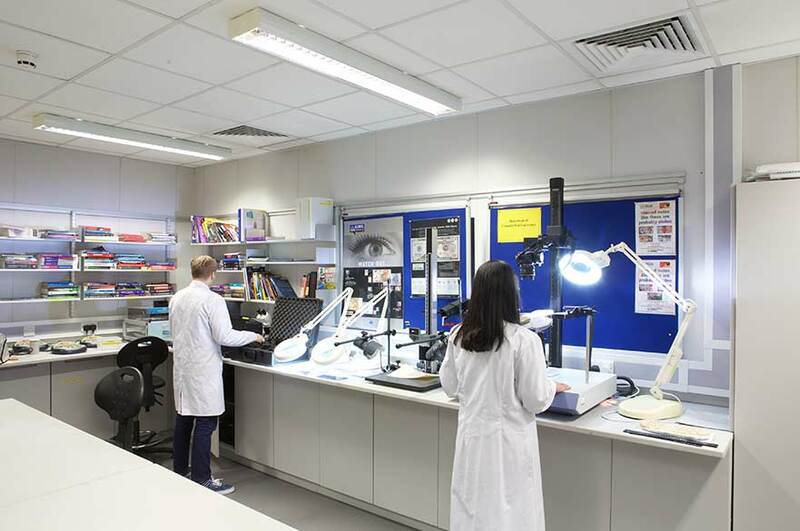 As a forensics science student here at Nottingham Trent University (NTU), develop your practical skills as you learn to examine documents for authenticity in our state-of-the-art document examination laboratory. Learn how to expose documents to a variety of different lights - including ultra violet and infra red – to identify areas where different inks have been used, whether built-in security features exist and even to determine whether an entry has been removed or replaced. You'll use this to ‘lift’ indented writing impressions from paper. This technique can detect indentations made on a page up to seven sheets below the page where the original writing is visible. We'll train you in best practice, using specialist photographic stands and light sources to teach you how to accurately photograph evidence. You'll also be trained in digital photography and image processing. You can choose from a broad range of undergraduate and postgraduate taught and postgraduate research courses. Our courses provide exciting opportunities for work placements and real life project work, giving you relevant transferable skills that are highly valued in industry.